Knowledge and willingness are just the beginning of a quality learning experience. They do not produce learning on their own. If we want to truly learn we must apply and we must do. Anything less and we are just consuming facts without comprehending what is really going on. False statements. Neither of these methods allow learners to ‘apply and do’; to attain a deeper level of expertise of the subject matter. Library Intelligence is different. Library Intelligence encourages learners to consume the facts and then asks them to ‘apply and do’; to use higher-order thinking skills to build upon what they have learnt to achieve a deeper level of understanding of digital literacy. Library Intelligence is not just about knowing what digital literacy is, but it is about knowing and applying it to our everyday work as library and information professionals. Developing self-paced online courses that ‘apply and do’ real world library skills within a 60 minute timeframe requires careful design of the learning experience. Each Library Intelligence course incorporates learning objectives that are linked to Bloom’s Taxonomy to intensify the learner’s level of expertise as much as possible. 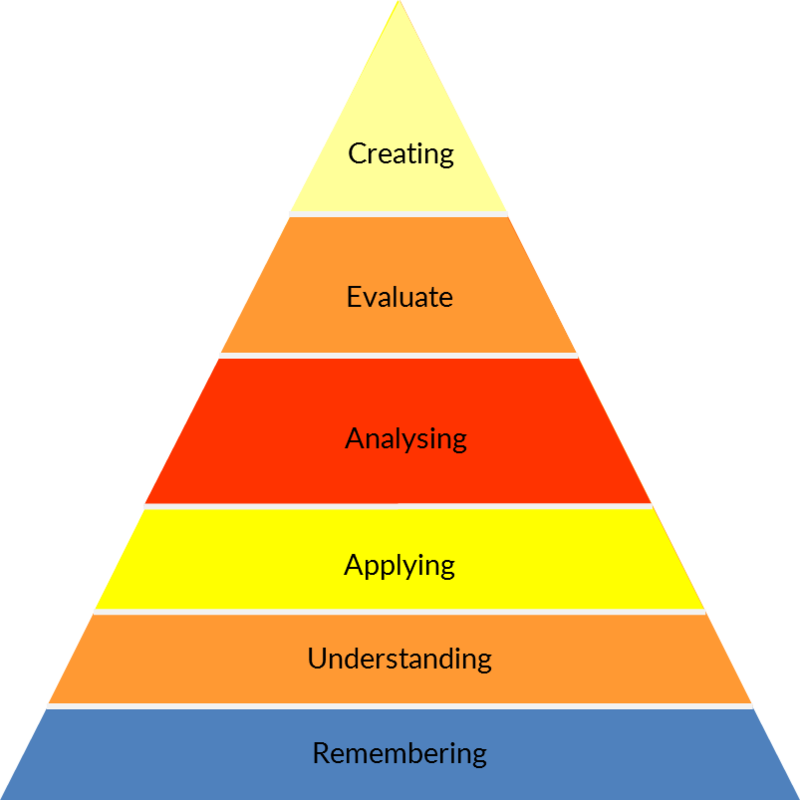 Bloom’s Taxonomy is often depicted as a pyramid as shown below. Remembering is the lowest level of the taxonomy. As you might expect, this level asks learners to remember something through recall, definition or recitation. Answering True/False statements is one way to test for this level of expertise. If the learner answers the questions correctly they have mastered this level of the taxonomy. A digital literacy example might be ‘Name the 8 elements of Doug Belshaw’s digital literacy model‘. Understanding tests a learner’s ability to explain ideas or concepts; to put information into their own words. For example ‘Explain in your own words your understanding of the Creative element of digital literacy.’ A learner that answers well demonstrates that they not only remember the information but also understand what it means. As a learner progresses through each level of the taxonomy they become more active in their learning. They are summarising, consolidating, problem-solving, reflecting, experimenting, creating and innovating. Online learning should not be a spectator sport. Knowing is not enough. We must ‘apply and do’. Next Post You Are Digitally Literate. Until You Aren’t.